A photograph purportedly showing a group of underappreciated Vietnam veterans is actually a frame from the comedy "Tropic Thunder." A photograph shows a group of underappreciated Vietnam veterans. I have seen a picture on FB that shows Viet Nam veterans. One looks like Ben Stiller, and another like Jack Black. Is this real? This is not a photograph of a group of Vietnam veterans, underappreciated or otherwise. This is a group of actors, including Robert Downey Jr., Jack Black, Jay Baruchel, Brandon T. Jackson and Ben Stiller, playing soldiers in the movie Tropic Thunder. … The big question is why? And there’s a reason. Money. Have you noticed that once you see these pages you don’t usually see them again? That’s because they are sold, stripped and get a new name—but they already have all of these likes in place. Facebook doesn’t allow this, but that doesn’t mean it doesn’t happen. Sadly, you are helping. 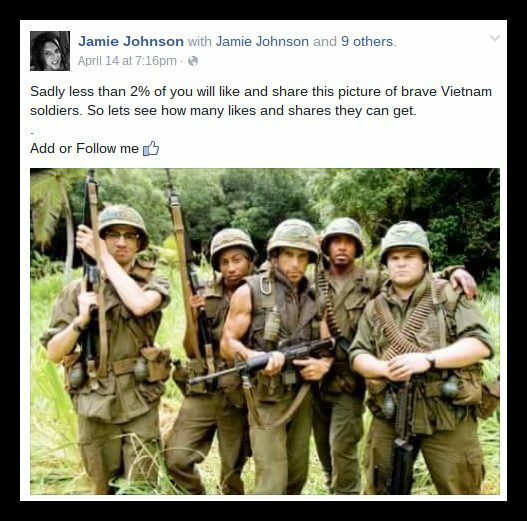 Even if this was a legitimate photograph of Vietnam combat veterans, it’s unlikely that “liking” it on Facebook would do much to make them feel appreciated.